The TOGGLER SnapSkru SP self-drilling drywall anchor installs into 3/8"- to 5/8"-thick drywall ceilings and walls without requiring a predrilled hole, includes #8 x 1-1/2" screws, and is made in USA. 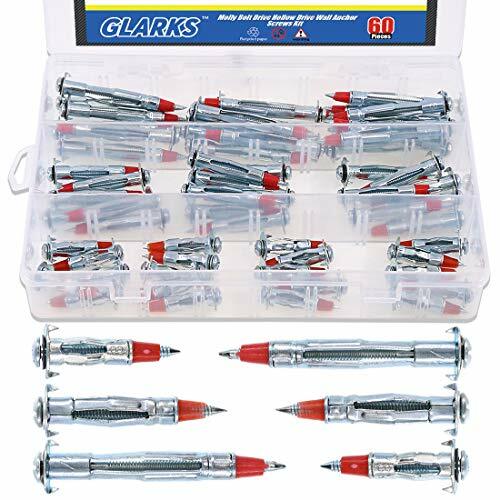 Its corrosion-resistant glass-filled nylon body installs into drywall with a Phillips driver, a hand drill, or a screw gun. The anchor's positive stop mechanism prevents the anchor from being driven too far into the drywall. Inserting an included screw activates the anchor's jaw, locking the anchor into place and compressing the drywall for a vibration- and shock-resistant hold. The jaws emit a noise when activated, providing audible confirmation that the anchor system has been installed successfully. If using screws other than those supplied, the anchor accepts #6 to #10 size sheet metal screws with a length equal to the thickness of the item being fastened plus 1-1/4". Anchor Screw Description 3/8" Drywall 1/2" Drywall 5/8" Drywall SPM Mini #6 x 1-1/4" 105 lb. 131 lb. 175 lb. SP #8 x 1-1/2" 108 lb. 149 lb. 178 lb. The TOGGLER SNAPTOGGLE BB toggle anchor provides a secure hold from within various hollow materials 3/8" to 3-5/8" thick including gypsum board, drywall, and concrete block, and is made in USA. The anchor requires a 1/4"-20 UNC-threaded metal bolt with a minimum length equal to the thickness of the item being fastened and the thickness of the mounting material plus 1/2". The anchor channel will not rotate when installing the bolt, whether installing by hand or with a screw gun, and will stay in place if the bolt is removed to facilitate fixture and screw changes. The SNAPTOGGLE anchor meets Federal Specification FF-B-588-D for Type V anchors. 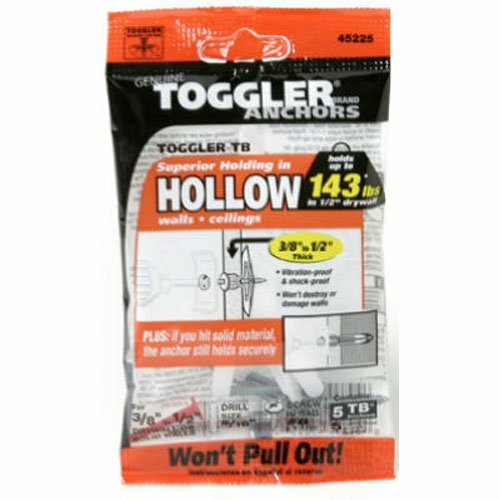 The TOGGLER Toggle TA hollow-door anchor provides a firm hold in 1/8"- to 1/4"-thick hollow-core doors and thin panels, includes #8 x 1-1/4" screws, and is made in USA. The anchor is made from polypropylene that resists corrosion, is nonconductive for anchoring electrical components, and is low-friction to facilitate screw installation. The anchor hammers into a 5/16" drilled hole until flush with the mounting material's surface. Before the screw can be inserted into the anchor to create a secure hold, the included key is used to open the anchor's wings behind the material. The fins on the anchor head grip the mounting material to prevent spinning when a screw is inserted, and the anchor will stay in place if the fastener is removed, facilitating fixture and screw changes. If using screws other than those supplied, the anchor accepts #8 to #12 size screws with a minimum thread length of 1". The Toggle TA anchor meets Federal Specification FF-B-588-D for Type IV anchors. 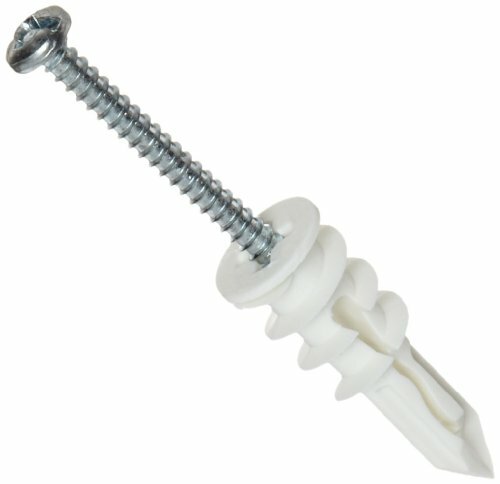 Anchor Drill Diameter Screw Description 1/4" Plywood 3/8" Drywall 1/2" Drywall 5/8" Drywall TA 5/16" #8 x 1-1/4" 265 lb. Not applicable Not applicable Not applicable TB 5/16" #8 x 1-1/2" Not applicable 126 lb. 167 lb. Not applicable TC 5/16" #8 x 1-3/4" Not applicable Not applicable Not applicable 237 lb. Industry safety standards recommend of the ultimate load. The above maximum load-testing figures are for in 5/8 in drywall and are provided as guides only and cannot be guaranteed. The age, condition and capacity of base materials must be considered. Requires a 1 spade bit or hole saw. Hole saw is recommended for plaster walls. The TOGGLER ALLIGATOR AF6 flanged anchor provides a secure hold in solid and hollow concrete, brick, stone, and drywall, and is made in USA. Once inserted into a 1/4" drilled hole in a wall, ceiling, or floor, the anchor accepts a #6 to #12 size screw with a thread length at least equal to the thickness of the item being fastened plus 1-3/8". The anchor head is flanged for additional stability compared to a flush-mount head when installing into hollow material and has fins that grip the mounting material to prevent spinning when a screw is inserted. When installed within a solid material, the corrosion-resistant polypropylene body expands and elongates to fill and mold to the hole. This helps distribute the force evenly throughout its length to help prevent wall fracture. When installed within a hollow material or a solid material with unexpected cavities, the anchor's jaws open as a screw is inserted, locking the anchor and screw within the material. Anchor Drill Diameter Screw Description 1/2" Drywall 3,500 psi Concrete A5/AF5 3/16" #8 sheet metal screw 57 lb. 544 lb. A6/AF6 1/4" #10 sheet metal screw 69 lb. 675 lb. A8/AF8 5/16" #12 sheet metal screw 85 lb. 1,025 lb. A10 3/8" #14 sheet metal screw N/A 1,168 lb. Anchor Drill Diameter Screw Description 1/2" Drywall A5/AF5 3/16" #8 sheet metal screw 125 lb. A6/AF6 1/4" #10 sheet metal screw 153 lb. A8/AF8 5/16" #12 sheet metal screw 171 lb. 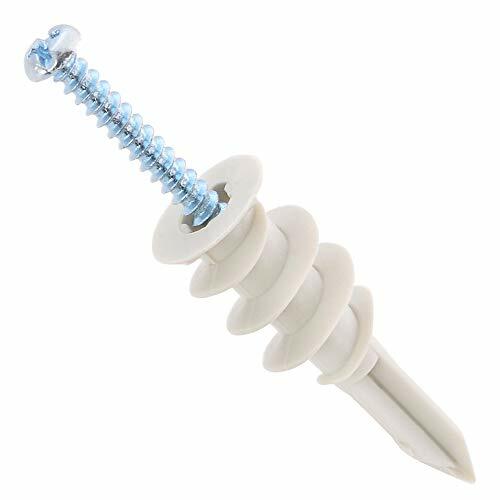 100 Large Drywall Anchors (14x43mm) 100 Phillips Screw #8 x 1-1/4"
Comes with 100 Large Anchors and 100 #8 x 1-1/4 Phillips screws. Each drywall anchor supports up to 50 lbs. 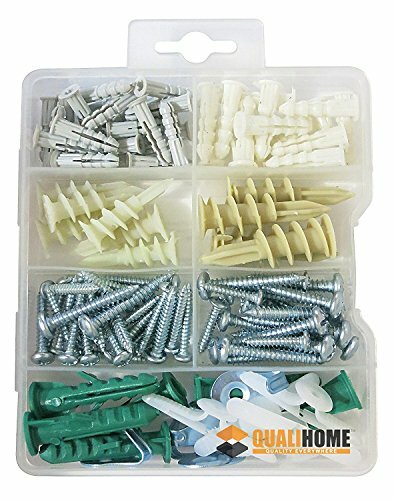 Product Type: High quality heavy duty molly bolt drive hollow drive wall anchor screws assortment kit. 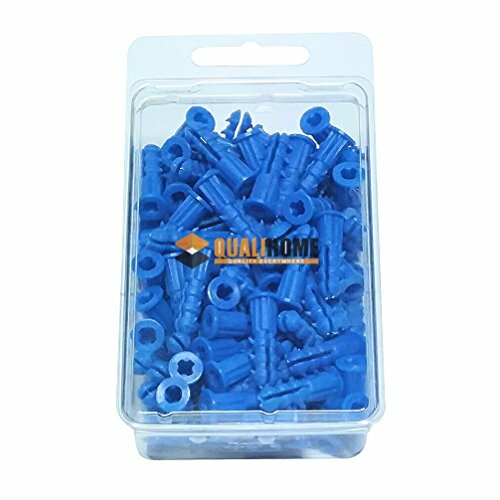 Package: In this kit, it include 3 size of 1/8SDx35mm, 1/8SDx46mm, 1/8SLDx59mm each for 20pcs, total 60pcs drive wall anchors packed in a durable plastic box, convenient for your use and storage. Quality: All the anchors are made of high quality zinc plated carbon steel, rust resistance and corrosion resistance, durable enough for you to hanging items. Feature: Heavy-duty hollow drive wall anchor expansion when installing, providing strong bearing capacity and safety. Application: Widely used in drywall, hollow block, plaster, tile, perfect for hanging curtain rods, lamps, photo frames, coat racks, power switches. The TOGGLER Toggle TB residential drywall anchor provides a firm hold in 3/8"- to 1/2"-thick drywall, includes #8 x 1-1/2" screws, and is made in USA. The anchor is made from polypropylene that resists corrosion, is nonconductive for anchoring electrical components, and is low-friction to facilitate screw installation. The anchor hammers into a 5/16" drilled hole until flush with the mounting material's surface. Before the screw can be inserted into the anchor to create a secure hold, the included key is used to open the anchor's wings behind the material. The fins on the anchor head grip the mounting material to prevent spinning when a screw is inserted, and the anchor will stay in place if the fastener is removed, facilitating fixture and screw changes. If using screws other than those supplied, the anchor accepts #6 to #14 size screws with a minimum thread length of 1-1/4". The Toggle TB anchor meets Federal Specification FF-B-588-D for Type IV anchors. BUY NOW and make the most of your living or working space by mounting your TV to the wall for convenient and comfortable viewing. 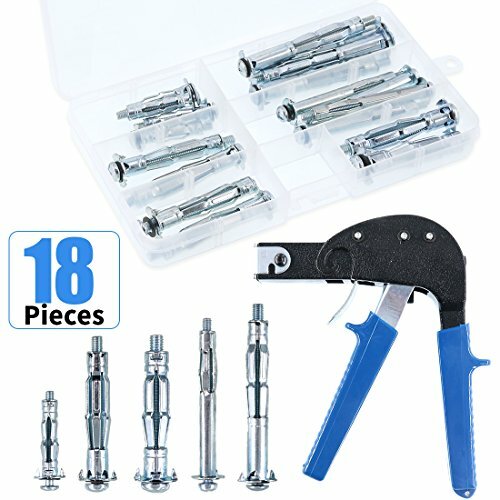 This product can also used for mounting when a stud is not available. 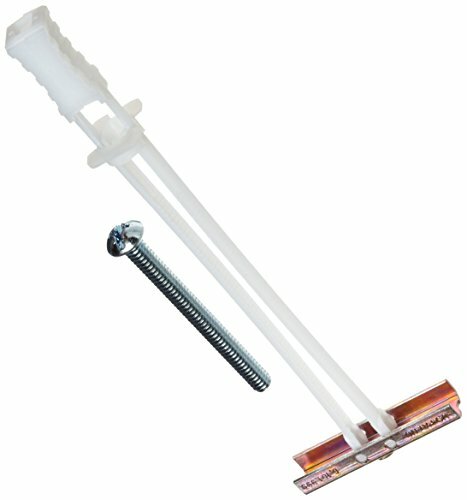 The provided revolutionary toggle bolts can hold upto 200lbs on 1/2" drywall. They make smaller holes and are 4x faster to install then wing bolts or wing toggles. Pre-installs without the bolt to make handling of fixture easier. Reusable in the same hole - remove the bolt without losing the anchor. STUD NOT REQUIRED. Ultimate tensile pull out strength 200 lbs on 1/2 drywall. 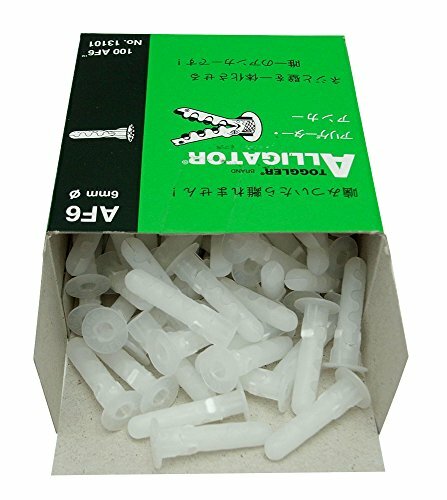 STRONGEST DRYWALL ANCHOR AVAILABLE (MADE IN USA) 4 Pieces of SNAPTOGLLER TOGGLE BOLTS provided can be used on Gypsum board, Drywall, Tile over drywall, Plasterboard, Composite panels, Cement board, Greenboard, Plaster, Stucco. Easy to use anchors compared to all other anchors available in the market. 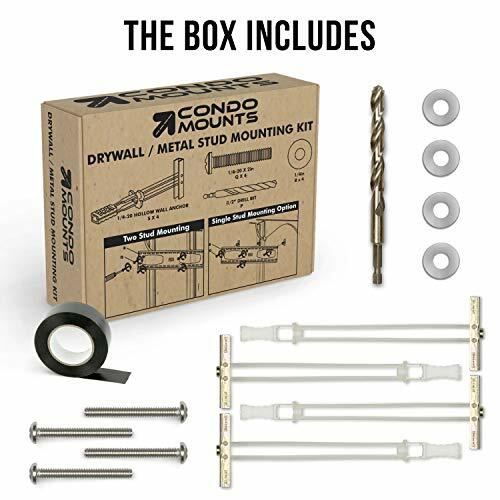 COMPLETE KIT - One 1/2 hex socket titanium drill bit, 4pcs of -20 UL Certified hollow wall toggle anchors, 4pcs of -20 x 2'' screws, 4pcs of '' washer, Electrical tape to mark positions of items you are mounting. Safe multiple trips to the hardware store. This drill bit provided can be used on most drills or driver because it has a hex shank. 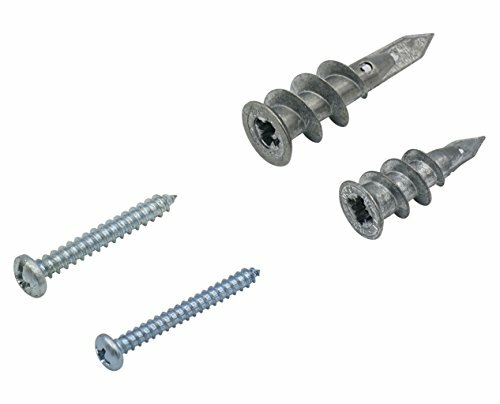 Perfect Screw length of 2 is provided catering for most wall types. OTHER MOUNTING USE - Mounting of Shelves,Cabinet mounting, Bathroom Accessories, Grab Bar, Vanity, Draperies, Curtain Rods, Blinds and Mirrors on - : Drywall, plaster over lath, gypsum, panels, cement board, MDF. 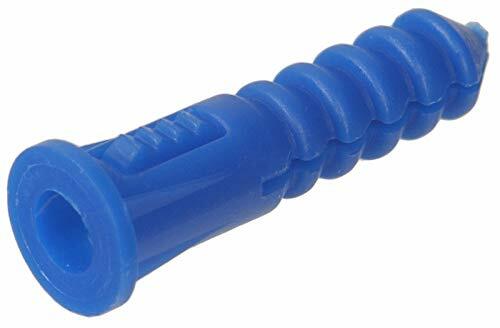 The TOGGLER SNAPTOGGLE BB toggle anchor provides a secure hold from within various hollow materials 3/8" to 3-5/8" thick including gypsum board, drywall, and concrete block, includes 1/4"-20 UNC bolts, and is made in USA. The anchor channel will not rotate when installing the bolt, whether installing by hand or with a screw gun, and will stay in place if the bolt is removed to facilitate fixture and screw changes. 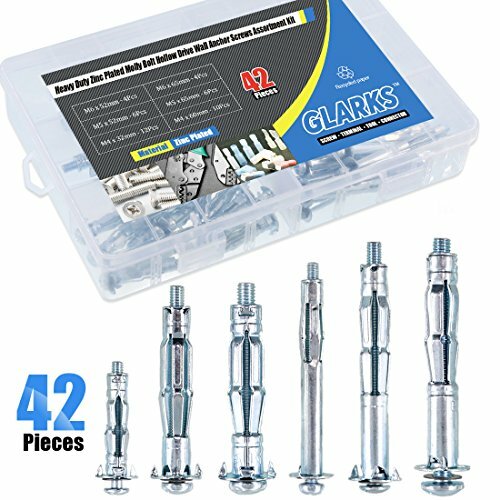 If using bolts other than those supplied, the anchor accepts 1/4"-20 UNC metal bolts with a minimum length equal to the thickness of the item being fastened and the thickness of the mounting material plus 1/2". The SNAPTOGGLE anchor meets Federal Specification FF-B-588-D for Type V anchors. The TOGGLER SnapSkru SPM Mini self-drilling drywall anchor installs into 3/8"- to 5/8"-thick drywall ceilings and walls without requiring a predrilled hole, includes #6 x 1-1/4" screws, and is made in USA. Its corrosion-resistant glass-filled nylon body installs into drywall with a Phillips driver, a hand drill, or a screw gun. 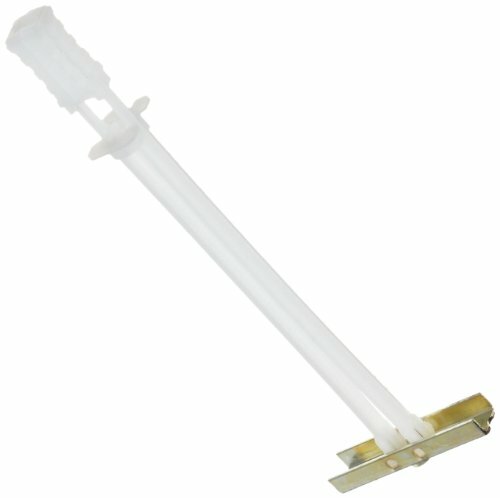 The anchor's positive stop mechanism prevents the anchor from being driven too far into the drywall. Inserting an included screw activates the anchor's jaw, locking the anchor into place and compressing the drywall for a vibration- and shock-resistant hold. The jaws emit a noise when activated, providing audible confirmation that the anchor system has been installed successfully. If using screws other than those supplied, the anchor accepts #6 to #8 size sheet metal screws with a length equal to the thickness of the item being fastened plus 1".